Jasmine is the most pupular JS library for unit testing web apps. In this tutorial, designed for beginners we'll help you to easily get started with unit testing using Jasmine. We'll also see how you can group suites for the sake of organizing your tests for more complex code bases. It's fast and has low overhead and no external dependencies. It's a batteries included library and offers everything you need for testing your code. It's available both for Node and the browser. It can be used with other languages like Python and Ruby. It does not require the DOM. It provides a clean and easy to understand syntax and also a rich and straightforward API. We can use natural language to describe the tests and the expected results. Jasmine is an open source tool that's available under the permissive MIT license. As of this writing the latest major version is Jasmine 3.0 which provides new features and some breaking changes. The 2.99 release of Jasmine will provide different deprecation warnings for suites that have different behavior in version 3.0 which will make it easy for developers to migrate to the new version. You can read about the new features and breaking changes from this document. You can also use Jasmine for testing your Python code with jasmine-py which can be installed from PyPI using the pip install jasmine command. This package contains both a web server that serves and executes a Jasmine suite for your project and a CLI script for running tests and continuous integrations. Jasmine is also available for Ruby projects via jasmine-gem which can be installed by adding gem 'jasmine' to your Gemfile and running bundle install. It includes a server for serving and running tests, a CLI script and also generators for Ruby on Rails projects. Start by downloading the latest version of Jasmine from the releases page. Then simply extract the zip file, preferably inside a folder in the project you want to test. -/src: contains the source files that you want to test. This may be either deleted if your already have your project's folder setup or can also be used when appropriate for hosting your source code. -/lib: contains the core Jasmine files. -/spec: contains the tests that you are going to write. -SpecRunner.html: this file is used as a test runner. You run your specs by simply launching this file. You obviously need to change the files included from the /src and /spec folders to contain your actual source and test files. First we require/import Jasmine and we use the loadConfigFile() method to load the config file available from spec/support/jasmine.json path then finally we execute Jasmine. You can also use Jasmine from the CLI which allows you to easily run Jasmine tests and by default output the results in the terminal. You may need to run sudo for installing npm packages globally depending on your npm configuration. spec_dir: specifies where Jasmine looks for test files. spec_files: specifies the patterns of test files, by default all JS files that end with Spec or spec strings. helpers: specifies where Jasmine looks for helper files. Helper files are executed before specs and can be used to define custom matchers. stopSpecOnExpectationFailure: when set to true will immediately stop a spec on the first failure of an expectation (can be used as a CLI option via --stop-on-failure). 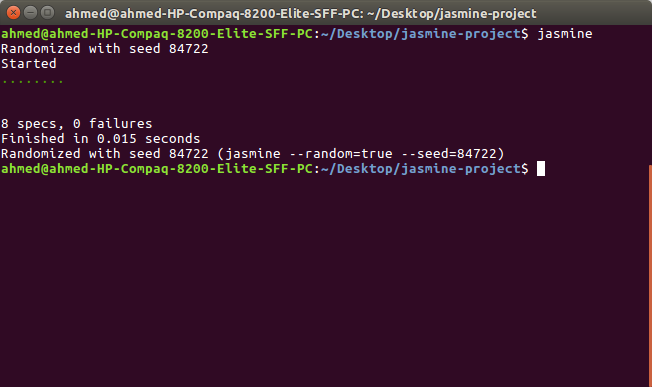 random: when set to true Jasmine will pseudo-randomly run the test cases (can be used as a CLI option via --random). The spec_files and helpers arrays can also contain Glob patterns (thanks to the node-glob package) for specifying file paths which are patterns you usually use to specify a set of files when working in Bash (e.g. ls *.js). If you don't use the default location for the jasmine.json configuration file, you simply need to specify the custom location via the jasmine --config option. You can find more CLI options from the official docs. In this section we'll learn about the basic elements of Jasmine testing such as suites, specs, expectations, matchers and spies etc. MyJSUtilities is the name of this top-level test suite. We are grouping related tests into tests for String Utils, Basic Math Utils and Advanced Math Utils and nesting them inside the top-level test suite MyJSUtilities. This will compose your specs as trees similar to a structure of folders. The nesting structure will be shown on the report which makes it easy for you to find failing tests. You can temporarily disable a suite using the xdescribe() function. It has the same signature (parameters) as a describe() function which means you can quickly disable your existing suites by simply adding an x to the function. Specs within an xdescribe() function will be marked pending and not executed in the report. A spec declares a test case that belongs to a test suite. This is done by calling the Jasmine global function it() which takes two parameters, the title of the spec (which describes the logic we want to test) and a function that implements the actual test case. A spec may contain one or more expectations. Each expectation is simply an assertion that can return either true or false. For the spec to be passed, all expectations belonging to the spec have to be true otherwise the spec fails. Just like suites, you can also exclude individual specs using the xit() function which temporary disables the it() spec and marks the spec as pending. Expectations are created using the expect() function that takes a value called the actual (this can be values, expressions, variables, functions or objects etc.). Expectations compose the spec and are used along with matcher functions (via chaining) to define what the developer expect from a specific unit of code to perform. A matcher function compares between an actual value (passed to the expect() function it's chained with) and an expected value (directly passed as a parameter to the matcher) and returns either true or false which either passes or fails the spec. You can chain the expect() function with multiple matchers. To negate/invert the boolean result of any matcher, you can use the not keyword before calling the matcher. Let's implement the specs of our example. For now we'll use we'll use expect() with the nothing() matcher which is part of the built-in matchers which we'll see a bit later. This will pass all specs since we are expecting nothing at this point. We have eight passed specs and zero failures. You can either use built-in matchers or also create your own custom matchers for your specific needs. toBeFalsy()/toBeTruthy() for testing for falseness/truthfulness etc. You can find the full list of matchers from the docs. Next, start with the String Utils suite and change expect().nothing() with the appropriate expectations. Jasmine provides the ability to write custom matchers for implementing assertions not covered by the built-in matchers or just for the sake of making tests more descriptive and readable. The failure message we get says Expected undefined to be defined which give us no clue of what's happening, let's make this message more meaningful in the context of our code domain (this will be more useful for complex code bases). For this matter, let's create a custom matcher. We create custom matchers using the addMatchers() method which takes an object comprised of one or many properties that will be added as matchers. Each property should provide a factory function that takes two parameters util, which has a set of utility functions for matchers to use (see: matchersUtil.js) and customEqualityTesters which needs to be passed in if util.equals is called and should return an object with a compare function that will be called to check the expectation. result.message  =  "Expected isEven() to be not defined." result.message  =  "Expected isEven() to be defined." The beforeEach function is called once before each spec in the suite where it is called. The afterEach function is called once after each spec in the suite where it's called. For example, if you need to use any variables in your test suite, you can simply declare them in the start of describe() function and put any initialization or instantiation code inside a beforeEach() function. Finally, you can use the afterEach() function to reset the variables after each spec so you can have pure unit testing without the need to repeat initialization and cleanup code for each spec. The beforeEach() function is also perfectly combined with many Jasmine APIs such as the addMatchers() method to create custom matchers or also with the done() function to wait for asynchronous operations before continue testing. When you are unit-testing your code errors and exceptions maybe thrown so you might need to test for these scenarios. Jasmine provides the toThrow() and toThrowError() matchers to test for when an exception is thrown or to test for a specific exception respectively. More than often, methods depend on other methods which means when you are testing a method you may also endup testing its dependencies. This is not recommended in testing i.e you need to make sure your test the pure function by isolating the method and see how it behaves given a set of inputs. Jasmine provides spies which can be used to spy on/listen to method calls on objects and report if a method is called and with which context and arguments. Jasmine provides two ways for spying on method calls: using the spyOn() or the createSpy() methods. You can use spyOn() when the method already exists on the object, otherwise you need to use jasmine.createSpy() which returns a new function. and.stub(): resets the default stubbing behavior. You can use a spy to gather run-time statistics on the spied function, for example if you want to know how many times your function was called. Please note that a spy function replaces the spied function with a stub by default. If you need to call the original function instead, you can add .and.callThrough() to your spy object. The two expectations expect(String.prototype.toUpperCase).toHaveBeenCalled() expect(spytoUpperCase.calls.count()).toEqual(1) have failed. If the code you are testing contains asynchronous operations, you need a way to let Jasmine know when the asynchronous operations have completed. By default, Jasmine waits for any asynchronous operation, defined by a callback, promise or the async keyword, to be finished. If Jasmine finds a callback, promise or async keyword in one of these functions: beforeEach, afterEach, beforeAll, afterAll, and it it will wait for the asynchronous to be done before proceeding to the next operation. Using done() with beforeEach()/it() ..
We can quickly notice a drawback of this method, we need to write our code to accept the done() callback. In our case, we didn't hardcode the done() method in our simulateAsyncOp(fn) but we have provided a callback parameter just to be able to call done(). If you don't want to create code that depends on how you write your test, you can use a promise instead and call the done() callback when the promise has resolved or better yet, in Jasmine 2.7+, if your code returns a Promise, Jasmine will wait until it is resolved or rejected before executing the next code. Jasmine 2.7+ supports async and await calls in specs. This relieves you from putting asserts in a .then() or .catch() blocks. The Jasmine clock is used to test asynchronous code that depends on time functions such as setTimeout() in the same way we test synchronous code by mocking time-based APIs with custom methods. In this way, you can execute the tested functions synchronously by controlling or manually advancing the clock. You can install the Jasmine clock by calling the jasmine.clock().install function in your spec or suite. After using the clock, you need to uninstall it to restore the original functions. You can also use the Jasmine Clock to mock the current date. In case, you didn't specify a time for the mockDate function, it will use the current date. If your asynchronous code fails due to some error, you want your specs to fail correctly. Starting with Jasmine 2.6+ any unhandled errors are sent to the currently executed spec. calling the reject() method of a Promise.